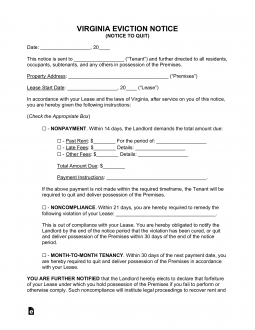 The Virginia eviction notice forms are used when a tenant in Virginia has either failed to pay the rent when it is due or has breached the terms of the lease. The first step in the process is to give written notice to the tenant that there is an issue and that they need to respond or face eviction. The landlord must have evidence that the notice was delivered to tenant. If the requisite time period has passed and tenant still has not vacated the premises or rectified the problem, then the landlord may go to the General District Court – Civil Division to file an Unlawful Detainer Action. The court will have the sheriff serve the tenant and there will be hearing within 30 days. If landlord prevails, the Court will issue a Writ of Possession and the sheriff will be authorized to remove the tenant. 5-Day Notice to Quit (Non-Payment) – This form may be used when tenant has failed to pay rent when it is due. The landlord may provide this notice and then wait the requisite five days before proceeding with the eviction process. 30-Day Notice to Quit (Non-Compliance) – If a tenant has failed to comply with the provisions of the lease, other than non-payment of rent, landlord must give 21 days notice to allow the tenant to rectify the problem or move out at the end of the 30 day period. 30-Day Notice to Quit (Month-to-Month Tenancy) – This form is used when a party wants to notify another party that they do not intend to renew a month-to-month tenancy. Rent is due on the date that the landlord and tenant agreed to in the lease. If tenant fails to pay on time, landlord may issue a notice giving tenant five days to pay before beginning the eviction process. Step 2 – If tenant does not respond to the notice by either fixing the situation or moving out then landlord may begin the eviction process by going to the General District Court – Civil Division which has jurisdiction over the area in which the property is located. The first step is to file an Unlawful Detainer action. The court will set a hearing date within 30 days and landlord will have it served on the tenant. Step 3 – If tenant either does not show up at the hearing or the landlord prevails in court, the court will issue a judgment for possession and the landlord can ask for a Writ of Possession. Step 4 – The local sheriff will execute the Writ of Possession and force the tenant to move out of the premises. Retrieve the Lease Agreement from your files. If you have any other relevant files, such as those concerning a violation, make sure these are available. It should be noted that any common information between the Lease and the Notice form should be identical. Locate the file image of this document on this page. The three buttons below this image (PDF, ODT, Word) will each link to the labeled file version of the Notice. Select the format you wish to work with, then download it to your machine. Report the Full Name of the individual who must comply with this Notice on the blank line following “To.” If this individual is Named in the Lease, make sure it is spelled the same way here. The sentence, “The premises herein referred…” contains five blank spaces. The first three require the City, County, and Zip Code where the Leased Property is located to be entered across them. Then, following the words “…designated by the number and street…” enter the Building Number and the Street of the Lease Property. The space after “Apt.” provides an area to report the Unit Number or Apartment Number of the Property. The following sentence, “In accordance with…,” must have the Signature Date recorded on the Lease Agreement reported using the appropriate blank spaces (Day, Month, Year). Four statements will be provided as applicable options for this Notice. You must select the one that states the Notice Terms you wish delivered to the Recipient. The first check box is a “Nonpayment” Notice to Pay an Overdue Rent in Five Days or to end Occupancy so the Landlord may regain possession. Make sure to report the Name of an Authorized Agent on the first empty space. Then, determine and report (on the next two spaces) the Total Sum Amount in Past Due rent the Recipient owes. Finally, report the compulsory Payment required and the Rental Period it applies using applicable spaces in the statement in bold. The second check box is a “Noncompliance” Notice that a Lease Violation has been committed by the Recipient and it must be corrected in Thirty Days. If it is not corrected in Thirty Days, the Tenant will be expected to remove their belongings and move out. The third check box is a “Month To Month Tenancy” Notice providing a minimum of Thirty Days’ Notice from the Calendar Date of the next required Rent Payment to the Tenant. Here the Landlord is naming the Date the Month To Month Tenancy will end and the Tenant is expected to remove their possessions and turn the Rented Property over to the Landlord. The fourth check box is a “Month To Month Tenancy” Notice providing Thirty Days’ Notice from the Calendar Date of the next required Rent Payment to the Landlord. Here, the Tenant is naming the Calendar Day when he or she is terminating an existing Month To Month Tenancy. The Landlord should expect the Tenant to vacate the Property and return it to the Landlord on the listed Date. The Delivery Confirmation may be made by the Delivery Agent in the “Certificate of Delivery” section. The Delivering Party must enter the Calendar Date when this paperwork has been delivered in the appropriate spaces, as well as the Name of the party who physically received this paperwork (or the recipient it is mailed to). Next, the Delivery Agent must indicate the level of Delivery Service that occurred by checking one of the statements next to a check box. This Delivery may be made by physically handing the paperwork to the intended Recipient, physically leaving the paperwork with a second party who will be considered responsible for completing the Delivery, or if it was mailed First Class directly to the intended Recipient. This section must be Signed by the individual acting in a Delivery Agent capacity. There will be a Signature Line provided for such verification.